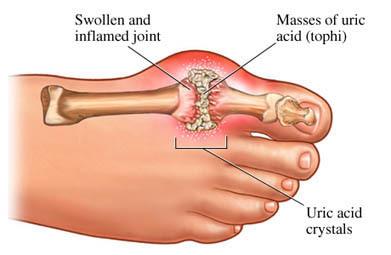 Gout is inflammation in and around joints due to uric acid crystals. Uric acid comes from the break down of purine from food or human cells. Sometimes the body makes too much uric acid. It may also have problems passing uric acid out of the body through the kidneys. Uric acid crystals form when uric acid levels get too high. This leads to gout. Gout is more common in men and older adults. But it can happen in men and women at any age. Certain foods and drinks may also raise your chances of gout. Most people with gout have more than one attack. This attack may be on many joints. Chalky deposits of uric acid called tophi can form. They often form in the elbows and earlobes, but may form in any part of the body. You will be asked about your symptoms and health history. A physical exam will be done. Fluid from the affected joint will be taken. This fluid will be tested for uric acid crystals. Treatment depends on whether the gout is acute or recurrent. Putting an ice pack on the joint may ease the pain. Keeping the weight of clothes or bed covers off the joint can also help. Lose weight slowly over time. Gout. American College of Rheumatology website. Available at: http://www.rheumatology.org/I-Am-A/Patient-Caregiver/Diseases-Conditions/Gout. Updated March 2017. Accessed June 5, 2018. Gout. Arthritis Foundation website. Available at: http://www.arthritis.org/about-arthritis/types/gout/. Accessed June 5, 2018. Gout. EBSCO DynaMed Plus website. Available at: http://www.dynamed.com/topics/dmp~AN~T115215/Gout . Updated March 22, 2018. Accessed June 5, 2018. Gout. National Institute of Arthritis and Musculoskeletal and Skin Diseases website. Available at: http://www.niams.nih.gov/Health%5FInfo/Gout/default.asp. Updated April 30, 2016. Accessed June 5, 2018. Gout overview. Family Doctor—American Academy of Family Physicians website. Available at: http://familydoctor.org/familydoctor/en/diseases-conditions/gout.html. Updated June 14, 2017. Accessed June 5, 2018. Gout management - prevention of recurrent attacks. EBSCO DynaMedPlus website. Available at: http://www.dynamed.com/topics/dmp~AN~T115215/Gout . Updated April 24, 2018. Accessed June 5, 2018. 1/4/2011 DynaMed Plus Systematic Literature Surveillance http://www.dynamed.com/topics/dmp~AN~T115215/Gout : Man CY, Cheung IT, Cameron PA, Rainer TH. Comparison of oral prednisolone/paracetamol and oral indomethacin/paracetamol combination therapy in the treatment of acute gout-like arthritis: a double-blind, randomized, controlled trial. Ann Emerg Med. 2007;49:670-677. Epub 2007 Feb 5. 1/4/2011 DynaMed Plus Systematic Literature Surveillance http://www.dynamed.com/topics/dmp~AN~T115215/Gout : Choi HK, Willett W, Curhan G. Fructose-rich beverages and risk of gout in women. JAMA. 2010;304(20):2270-2278. 4/24/2014 DynaMed Plus Systematic Literature Surveillance http://www.dynamed.com/topics/dmp~AN~T115215/Gout : Wise JN, Weissman BN, et al. American College of Radiology (ACR) Appropriateness Criteria for chronic foot pain. Available at: http://www.acr.org/~/media/ACR/Documents/AppCriteria/Diagnostic/ChronicFootPain.pdf. Updated 2013. Accessed June 29, 2015.